A special collection for the Panerai boutiques in North America. The company Officine Panerai presents a new collection of hours devoted to their new boutiques in North America. The company Officine Panerai presents a new collection of hours devoted to their new boutiques in North America. 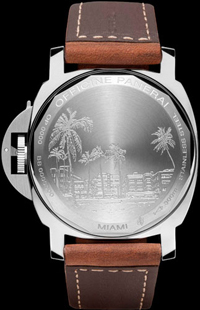 Feature of the new hours – a unique engraving on the case back of each model, designed to reflect the character of each city, where the boutique. And the first series of special collections – watch Luminor Marina 44, dressed in a polished steel case that will be presented for sale in the boutique brand La Jolla – California, and Bal Harbour, Palm Beach – Florida, in late July. The back cover model La Jolla, for example, is decorated with engraved famous rocky coves of the city. The company then plans to watch in steel – Radiomir 10 Days GMT. The rear cover will be decorated with engravings hours dedicated boutiques in Bal Harbour and Palm Beach, representing the streets and skyline with palm trees. In autumn 2012 Panerai will also introduce another model – Panerai Luminor 1950 10 Days GMT Oro Rosso, pink gold, and of course, with a special engraving on the back of the clock. Buy watches will be available only in specialized boutiques in the U.S., where the products will be presented.